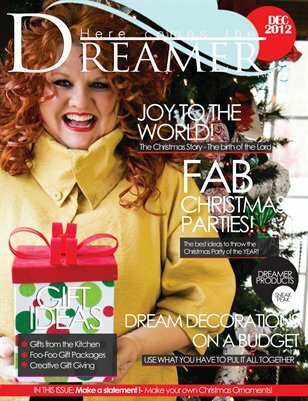 Here Comes the Dreamer Christmas Edition Magazine is chock full of Christmas Inspiration for your home! From Dreamer decorations to sumptuous holiday recipes. Throw a fabulous Christmas party or have an intimate Christmas brunch for a few close friends. Kim, the Queen of Foo-Foo shows you how to use what you have around the house to make one of a kind Christmas centerpieces and ornaments. Get Information, Get Ideas and Get Inspired!